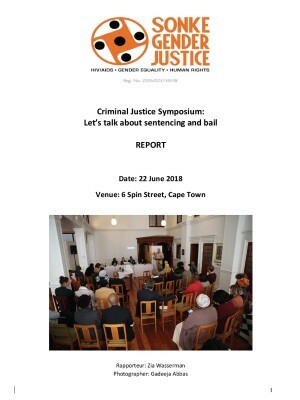 On 22 June 2018, Sonke Gender Justice hosted a criminal justice symposium, with a focus on bail and sentencing. The purpose for the symposium stemmed from the recognition that the current model and understanding of both bail and sentencing have had considerably negative effects on remand detainees and incarcerated persons. These include: overcrowding, disease, lack of rehabilitation programmes, and the effective criminalisation of poverty. Therefore, there was an assumption that relevant stakeholders and broader civil society would benefit from engagement with experts in the field, including academics, judges, and previously incarcerated persons. Listen to an audio clip of Constitutional Court judge Edwin Cameron, Venessa Padayachee, Thulani Ndlovu and Jean Redpath speaking at the event here.